After several hundred hours spent following birds around the savannahs, Flower’s observations show that this scam is highly effective. Most of the drongo alarm calls were false, as defined by the absence of predators and the fact that the drongo itself did not hide after sounding the alarm. Nearly half of all food-stealing events involved false alarms by the drongos (both “chink”-type and mimicked), and the target animals almost always responded by fleeing to cover and leaving their food behind. Even the other members of the meerkat and babbler groups would flee in response to a false alarm. 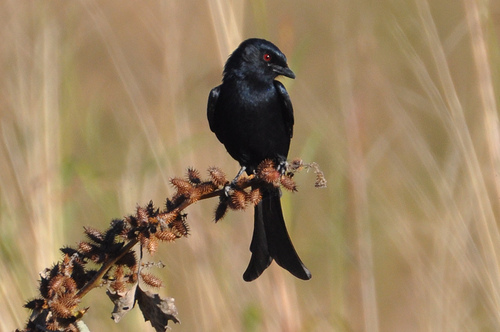 Drongo alarms also passed the critical tests of a deceptive signal. First, they are not merely working by coincidence. Drongos gave far more false alarms when playing the thief compared to when they were foraging alone. Furthermore, the lie sounds just like the truth, since analysis of sound recordings showed that false alarm calls are no different from the real thing. Flower demonstrated this for the drongo-type “chink” as well as a mimicked glossy starling alarm. When Flower played these same recordings for the meerkats and babblers, they responded by abandoning food at about the same rate, regardless of whether the recorded call was a true or false alarm. Indeed, the recordings of drongos mimicking starlings were about as effective as real starling alarms at getting the other animals to flee. By comparison, the meerkats and babblers did not budge for other territorial (non-alarm) calls that drongos typically make. This is convincing evidence that birds can use false alarm calls in a truly deceptive way, and it gives us a new perspective on the advantages of vocal mimicry. A flexible repertoire might help drongos avoid becoming the boy who cried wolf, preserving the effectiveness of their false alarms. It seems like a highly sophisticated trick. Yet another recent study proves that birds can create even greater illusions of an optical nature. Like most of their close relatives, the great bowerbirds of northern Australia court females by building elaborate structures out of twigs that they decorate with a variety of coloured objects. From species to species, these structures vary, with some preferring different floorplans and colour schemes. The common theme is order. Bowerbirds have a design in mind, and if you mess with it, they will work to get things back into the preferred form (e.g., watch the first few minutes of this video). A great bowerbird male works on his bower. 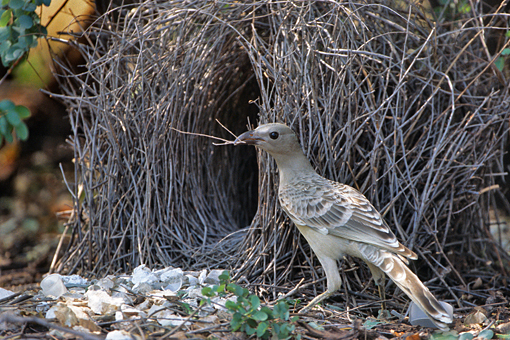 Great bowerbirds build a narrow avenue of twigs, with two display courts at either end. These are carpeted with small stones and shells and then decorated with red and green treasures. Females will visit and inspect a male from a fixed position in the centre of his bower, a fact that is key to understanding the clever illusion in his design that was recently demonstrated by John Endler and his colleagues. Remarkably, the males arrange the light coloured stones covering the courts according to a size gradient: they put the smallest stones closest to the bower and the largest ones furthest away3. From the female’s vantage point, this should create an optical illusion of size and distance, making the floor of the court seem smaller and perhaps emphasizing the male when he is standing on top of it (see image on the left below). Left: an image of a normal bower with objects arranged according to a size-distance gradient. Right: a bower altered for the experiment. From Endler et al. 2010. John Endler and his team took a closer look at this behaviour, choosing some bowers for remodeling. They reversed the object size gradient on the males, switching the small stones in front of the bower with the larger ones farthest away to see how the birds would respond (see image on the right above). Using digital photography, the researchers tracked the bower layout over time and compared the experimental bowers with unaltered ones. All the birds in the study were continuously re-adjusting their courts. In three days, the males with the altered bowers had restored the original size-distance illusion. 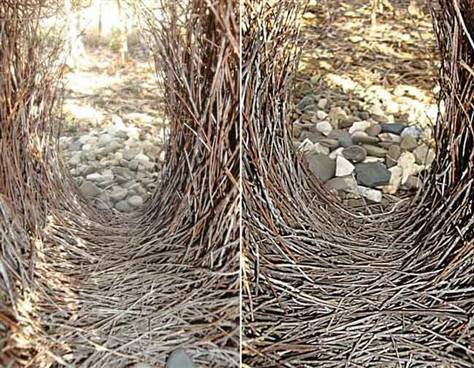 By analyzing the position of a few easily recognizable objects on each court, the researchers were able to show that the bowerbirds were not just putting specific stones back in their place; they were re-establishing the gradient. The conclusion is astonishing. Like artists rendering a realistic three-dimensional scene on a flat canvas, great bowerbirds create false perspective. In fact, bird artists were almost certainly first to discover this technique. It took the Renaissance for us to fully develop our use of the optical trick, and in all likelihood the birds have been doing it much longer. Both the drongos and the bowerbirds reminded me of some of the trickery I saw during my peacock field work. In 2009, Bob Montgomerie and I showed that peacocks orient their courtship displays at a particular angle relative to the sun, and that they use a special sequence of maneuvers to coax females into the right position to observe their displays4. This probably enhances the appearance of the male’s iridescent colours for the female. But do the males really need to be aware of their deceptions in order to perform them? Tom Flower suggests that the answer is no: drongos could easily learn that alarm calls work just by trial and error, since the calls lead to food rewards. Similarly, the bowerbirds might learn their trick based on small adjustments to the bower layout that tend to get a positive response from females. John Endler notes that while males are busy with maintenance work, they frequently peek at the court from the female vantage point. Perhaps they instinctively know what looks “good” and use trial and error to achieve it. The same goes for peafowl. My findings suggested that certain males were much better at orienting towards the sun than others. Maybe it takes years of practice to learn how to enhance their displays in this way. From Clever Hans the horse to B. F. Skinner’s superstitious pigeons5, psychology has shown us that animals can learn to respond to all sorts of subtle cues. This can lead to complex and ingenious behaviour without conscious awareness. Our natural tendency to look for intentions in the actions of others makes it hard for us to accept the simplest explanation. And maybe we should hold on to some part of that illusion. A more advanced awareness, though not strictly required, would certainly make these avian tricks more effective. Ridley and Raihani. 2007. Behavioral Ecology 18: 324-330. Flower. 2010. Proceedings of the Royal Society B.
Endler et al. 2010. Current Biology 20: 1679-1684. Dakin and Montgomerie. 2009. Behavioral Ecology and Sociobiology 63: 825-834. Dawkins. 2007. The Enemies of Reason. Channel 4. The blog looks great! Nicely written and very accessible to a non-birder. I look forward to following you and your adventures!